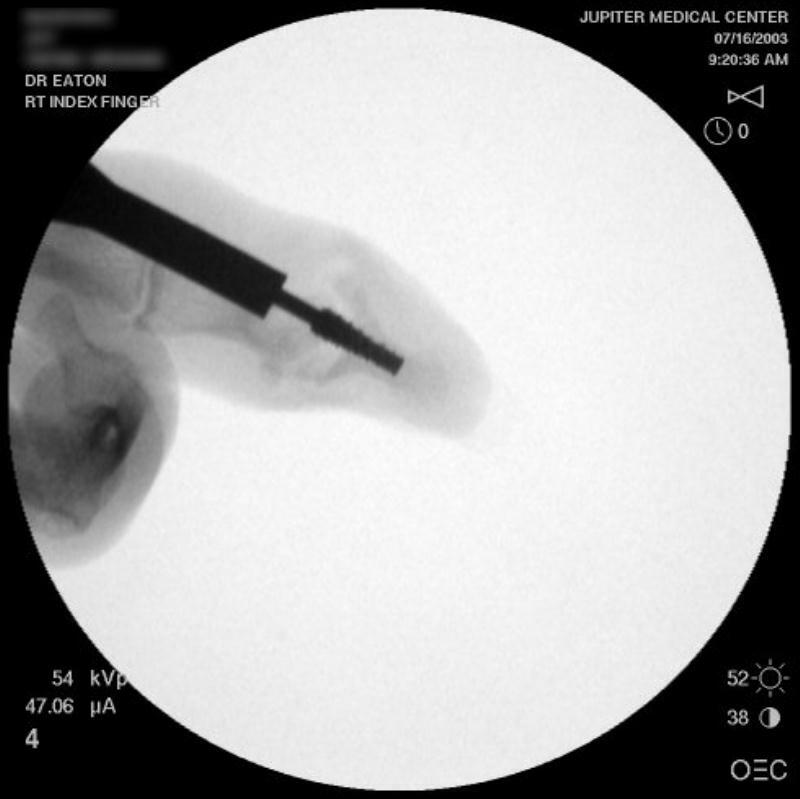 These two cases illustrate the use of the Ascension PIP joint implant arthroplasty in the DIP joint position. 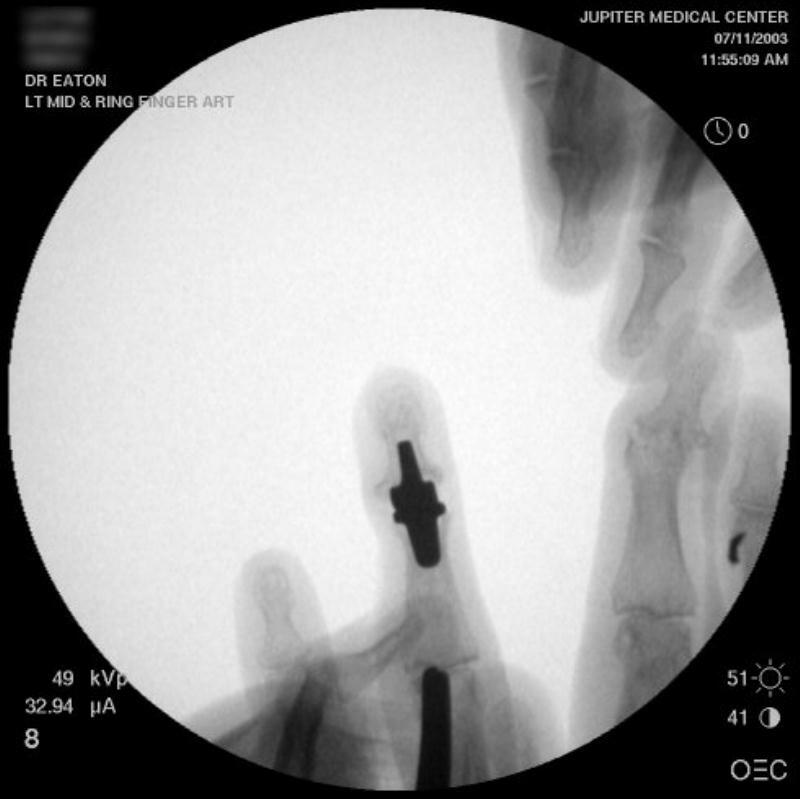 The stem of the distal component is too wide to fit into the typical distal phalanx, but the proximal component stem will, and in selected cases, the implant will fit in this position if it is placed in a reversed proximal-distal position. 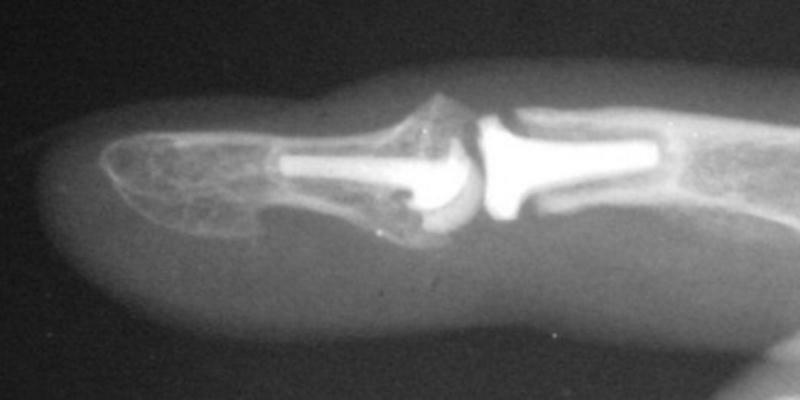 These cases illustrate this technique - not as an endorsement, but as a demonstration of technical feasibility. 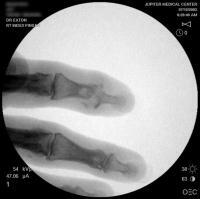 At one year, each reconstructed joint was painless and had about 30 degrees range of motion. 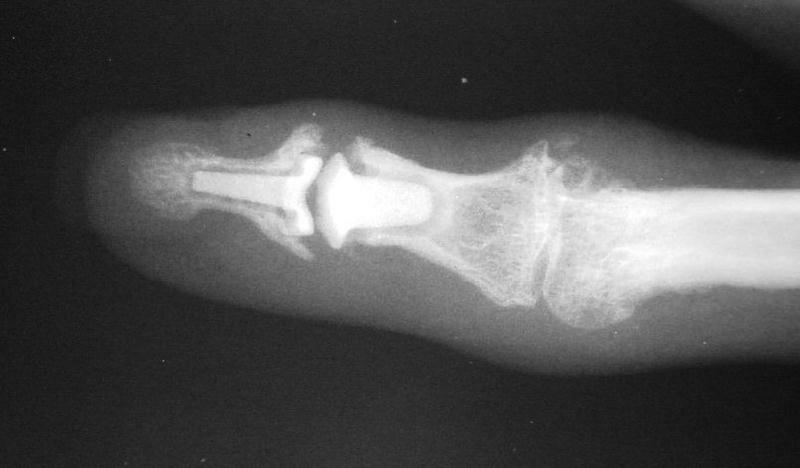 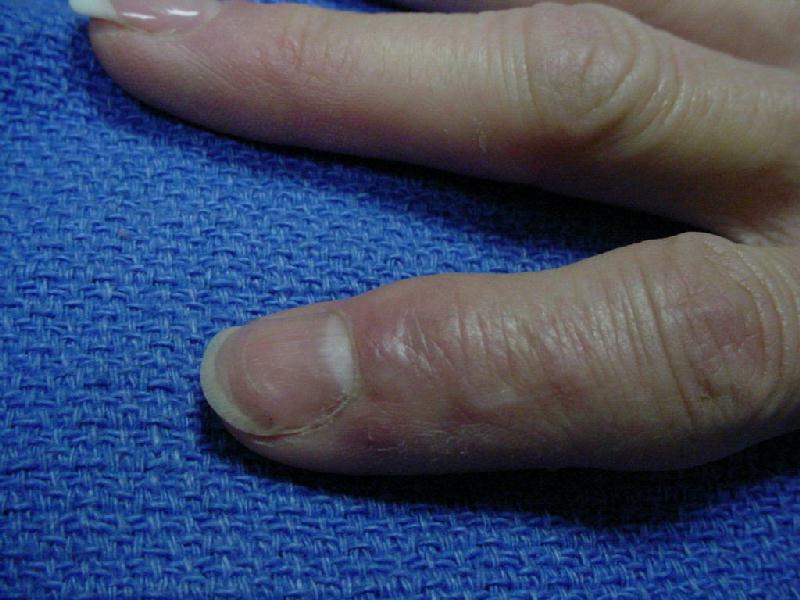 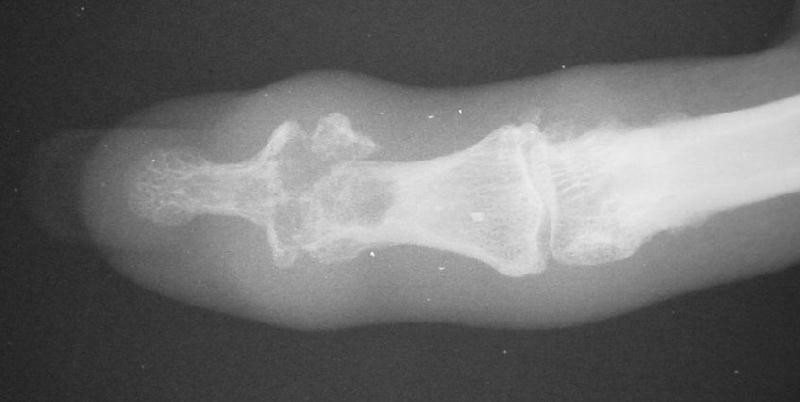 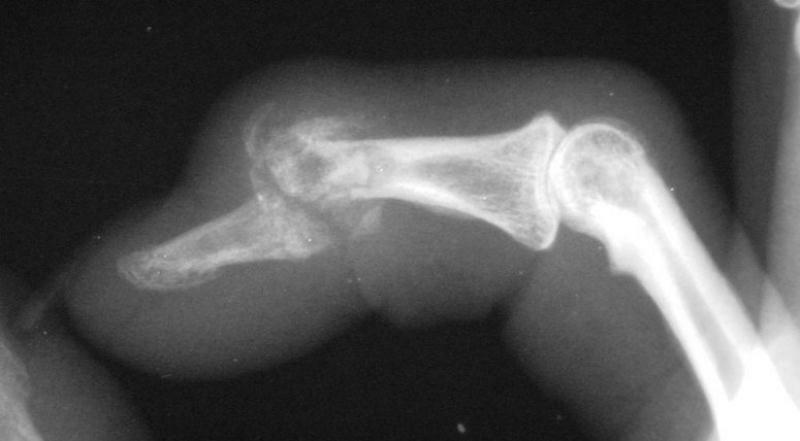 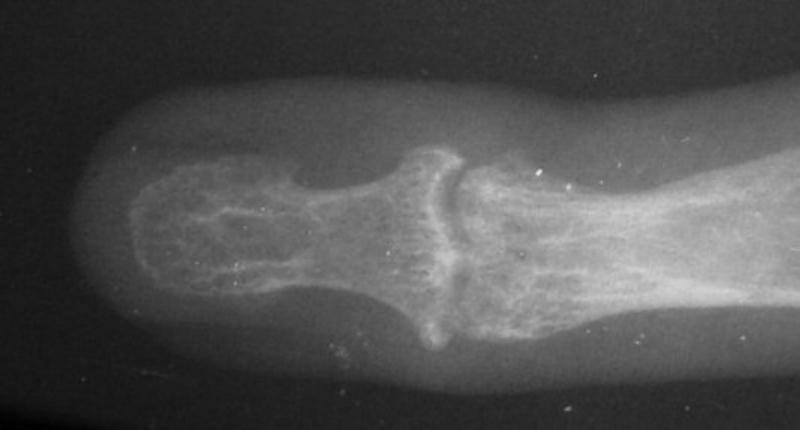 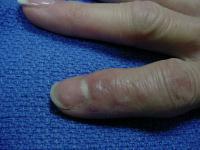 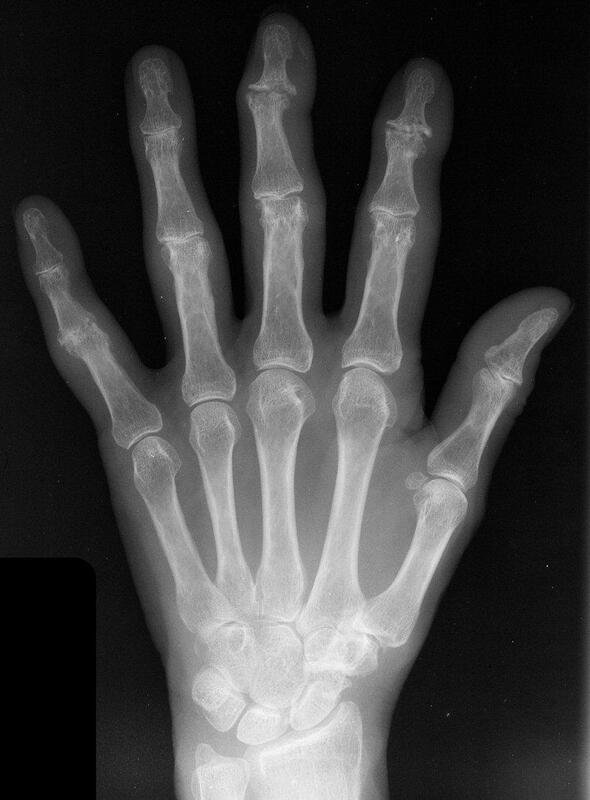 Distal interphalangeal erosive osteoarthritis severe enough that the diagnosis of giant cell or other tumor was suspected. 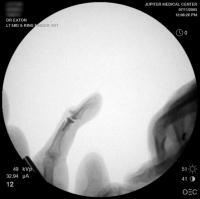 Fortunately, no tumor was encountered at surgery. 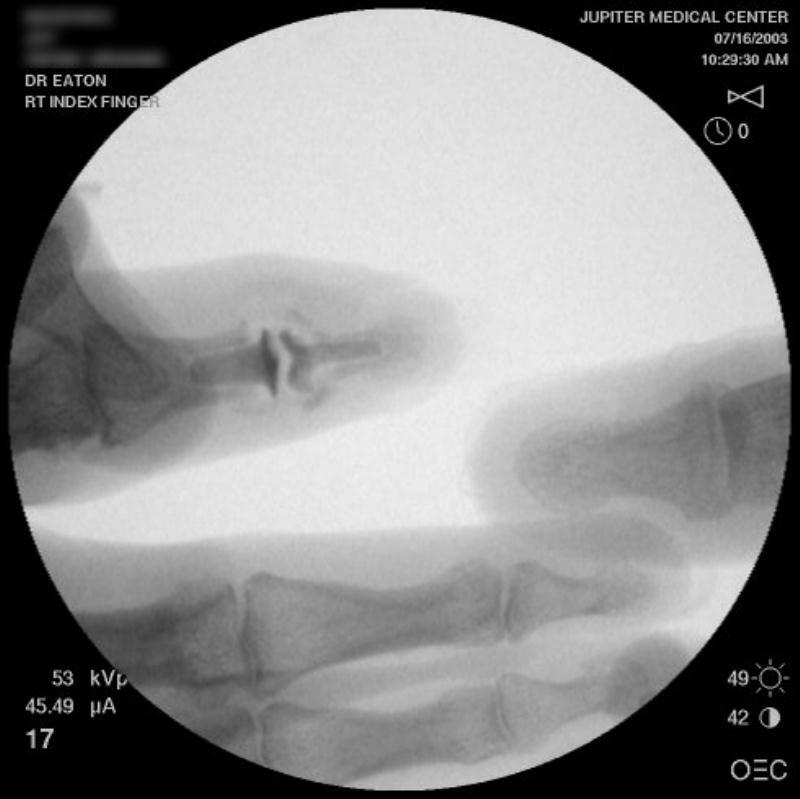 Dorsolateral eponychial splitting incision. 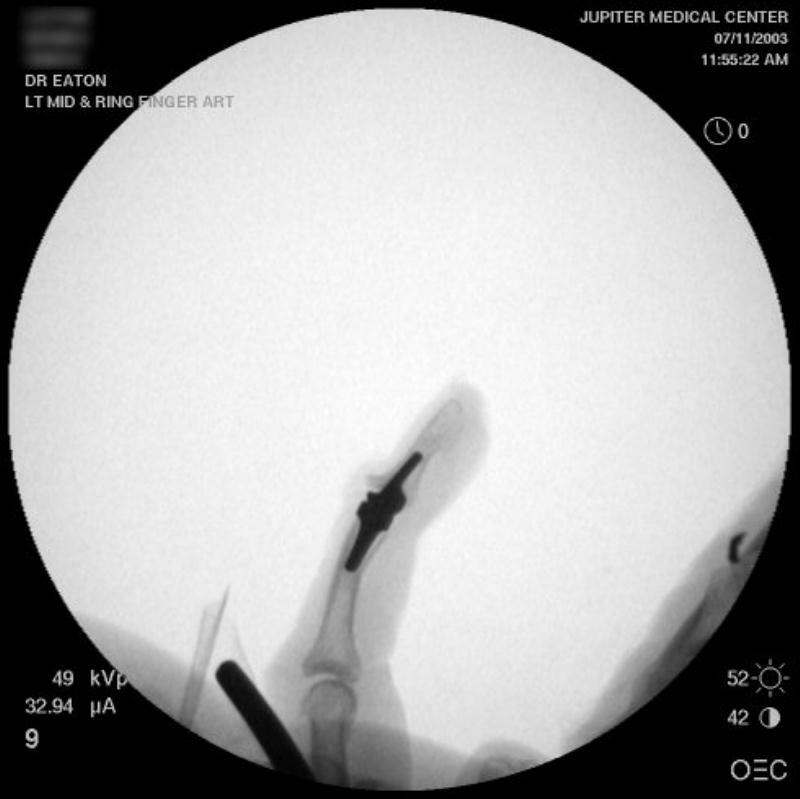 The black debris represents foreign body pencil lead debris from a childhood injury. The trial implant sizer shows the true size of the implant. 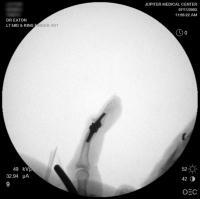 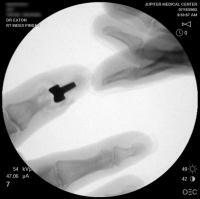 The final implant has a radiolucent coating which makes it appear smaller than it is on Xray. 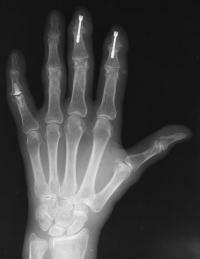 The implant in place. 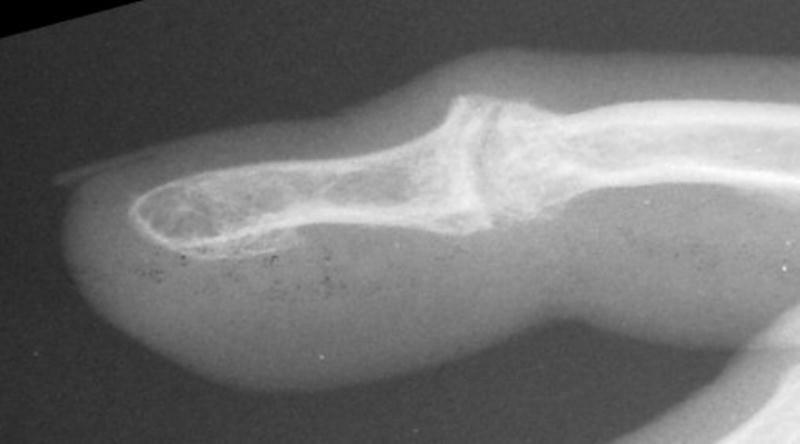 The approach was similar to the bayonette exposure demonstrated in this case. 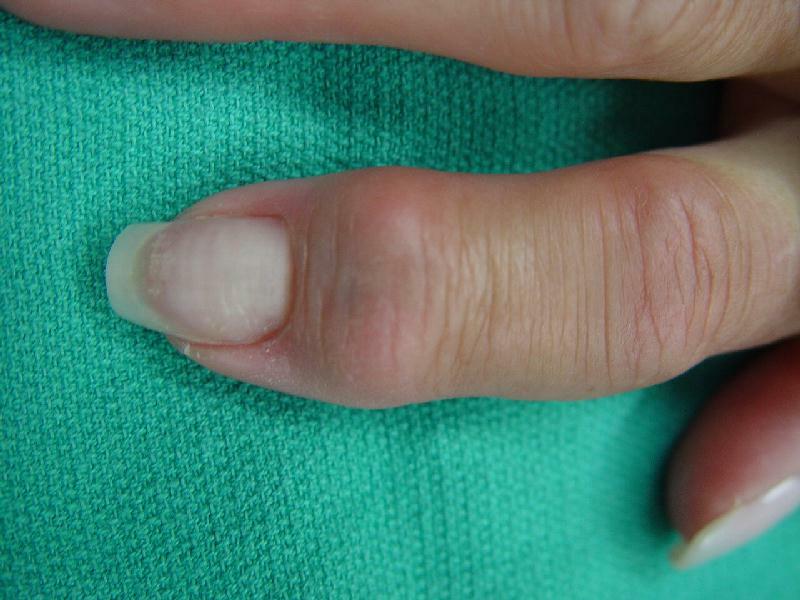 Progressive PIP changes remain a problem. This patient had previous experience with both DIP fusion and PIP arthroplasty. 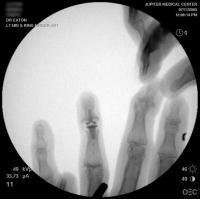 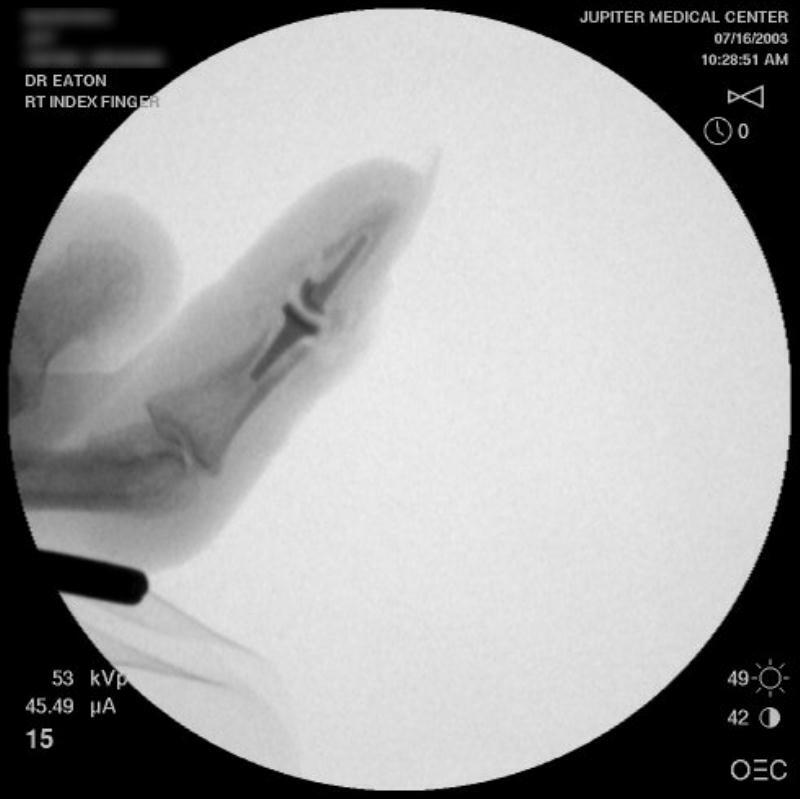 Ring finger DIP joint of the opposite hand.